Posted By:Unknown | At:6:57 AM Be the first to comment! As usual you would think assume that such an article would draw a lively debate, but what ensued was nothing short of racist banter that makes an Army brat like myself very sad for the men and women that serve in our armed forces. The new AR 670-1 clearly defines the different hairstyles and gives soldiers specific guidance on what’s allowed, he said. Leadership training released in mid-March, published before the reg was official, includes photos of a number of unauthorized hairstyles , several of which are popular among black women. The Army defines “twists” as two distinct strands of hair twisted around one another to create a rope-like appearance. 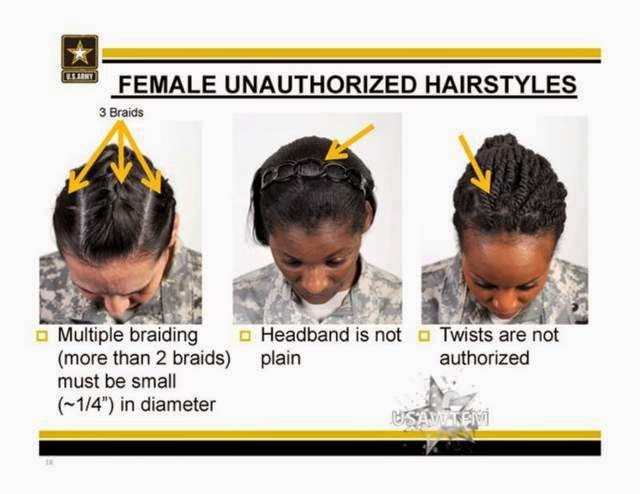 Jacobs said twists are the go-to style for black female soldiers going to the field because it “makes it easy to take care of in the field,” she said. Her hair is naturally thick and curly, making it impossible to pull into a bun, Jacobs said. In the White House petition, Jacobs calls on the Army to reconsider changes to AR 670-1. “Females with natural hair take strides to style their natural hair in a professional manner when necessary; however, changes to AR 670-1 offer little to no options for females with natural hair,” she said in her petition. The changes are “racially biased, and the lack of regard for ethnic hair is apparent,” she further states. Click here to read the entire article. As always with an article of this magnitude, you would expect a very spirited debate to ensue but what transpired in the comments section saddened an Army brat such as myself. Some of the most racist and vile things were hurled at the black female soldiers. Some even suggested the women just get out of the military if they couldn't handle the new regulations. Click here to read the comments and tell me what you think.